“I know from experience that every individual can make a difference in whatever cause you choose to engage. The key is to make a conscious choice to get involved and then do it. I was fortunate to be in the right place, Toastmasters. I have never looked back to question my choices. I know where I came from, and how I started…” source unknown. Past District Director (PDD) Tay Yiang Ping DTM of Singapore was a practicing Architect for 5 years, and turned an IT businesswoman, as CEO of an IT company for 15 years, providing computer aided design and drafting software and hardware solution and training services. With her company’s motto “Overwhelmingly Delight Our Users”, the company received many excellence awards from its principal company in USA. She sold the company to a Canadian Public Listed Company in 2001, became the Managing Director till 2003 before retiring as a full time housewife. She and her supportive husband have 3 lovely daughters. 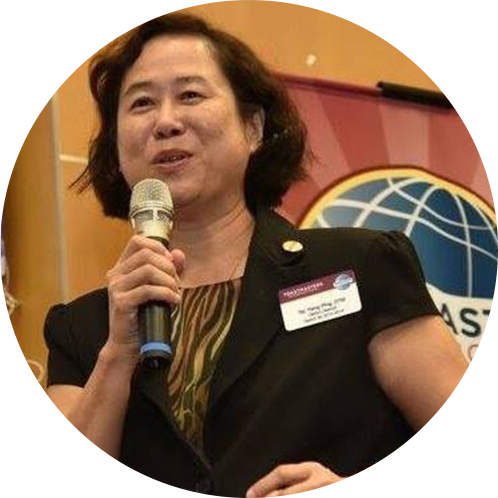 Yiang Ping joined Toastmaster in 1999, has served all club officer positions, District Webmaster, Area Governor, Division Governor, Club Sponsor, Club Mentor, District Secretary, Lt. Governor Marketing (LGM), Lt. Education and Training (LGET), District Director. She received Excellence in Marketing Award and Excellence in Lieutenant Governor Education and Training award from Toastmasters International. District 80 was awarded Select Distinguished District when she served as District Director 2015-2016 for District 80, Singapore. Yiang Ping is a Grassroots Leader as Member of Cairnhill Community Club Management Committee since April 2016. She’s Certified Trainer by Institute of Adult Learning on Advanced Certificate in Training and Assessment since 2017.